Pioneers in the industry, we offer rubber calender machine from India. We are engaged in offering a high quality range of Rubber Calender Machine to the customers in varied ranges and specifications. 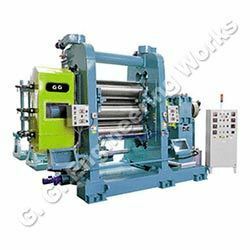 These machines are manufactured by employing latest technology and advanced machine at our end. Moreover, we make sure to deliver the ordered consignments at the clients’ premises within the stipulated time frame. The major application of Calendar is to handle a variety of products namely sheets for lining, hospital bed sheets, frictioning of fabrics for bicycle/motor cycle/auto tyres, hoses beltings, profiling, cushion gum, single coating, laminating doubling etc. Special Calenders for profiles Inner liner can be made. During the sheeting process, the machine can force out the air existed in the material for producing the product without air bubble after vulcanization. Our 3ROLL 8'x 24' Calender is widely used for cushion/tapes/treads. This Calender is most economical for specific purpose and avoids extra expenditure due to simplicity in design. You will get a superior calendaring effect with the G. G. Calender.